This week’s ghoulishly gastronomic installment brings you the inspirations of Robert Louis Stevenson’s The Strange Case of Dr. Jekyll and Mr. Hyde, the classic tale of man’s struggle against his evil within. The novella, as I’m sure you’re well aware, has taken countless incarnations in pop culture, from the big screen to children’s cartoons, and from rock to hip hop. Anyway, my first recipe inspired from Stevenson’s story captures the other characters’ surprise in learning that Hyde is the embodiment of Jekyll’s “impatient gaiety of disposition,” as he so eloquently puts it. It’s a riff on Dr.Jekyll’s butler’s description of Mr. Hyde. It’s a bone marrow brulee: a sweet custard incorporating beef marrow, which I baked first and spooned back into the roasted marrow bones. 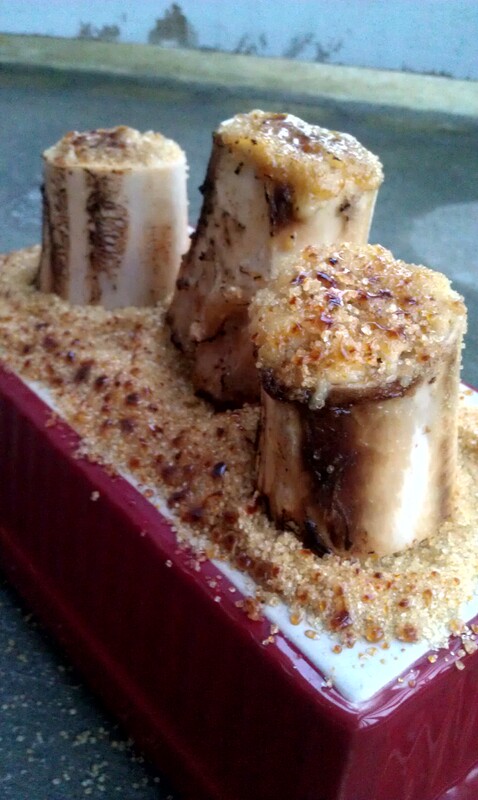 The thought of eating bone marrow makes some people shudder, but it’s utterly delicious. Just like avocado is butter for vegans, bone marrow is butter for carnivores. (Or meat enthusiasts.) I’ve never seen a sweet preparation of bone marrow – the surprise element – and this dish tastes every bit as decadently sinful as Jekyll’s indulgences during his duplicitous experiments. It’s best served on a sweet, crunchy cracker, with sugared berries and a drizzle of a citrusy simple syrup. I used the Blood Orange Simple Syrup that I made for the cocktail below. And the second recipe is a cocktail based on the potion that turns Dr. Jekyll into Mr. Hyde. 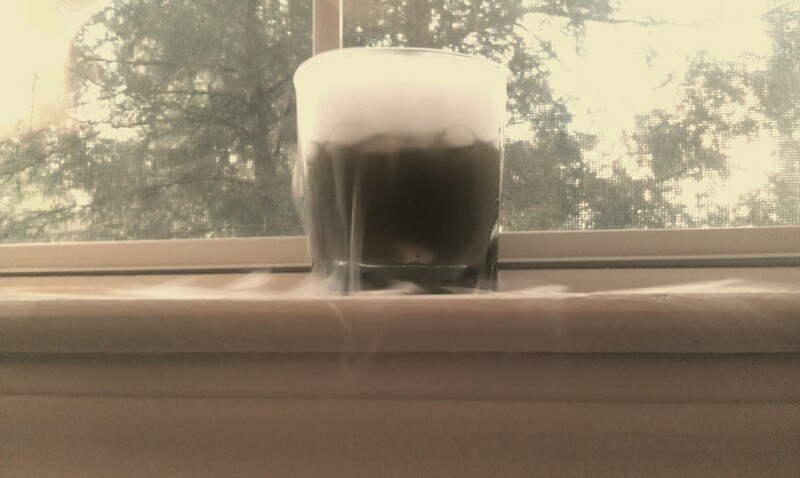 I couldn’t pass up the opportunity to use dry ice in the kitchen. I’m going to call it a Mimosa Driver. Or maybe a Jekyll Driver. That’s catchier. It’s a mimosa/screwdriver hybrid, basically meaning it’s a mimosa with a shot of vodka on top. 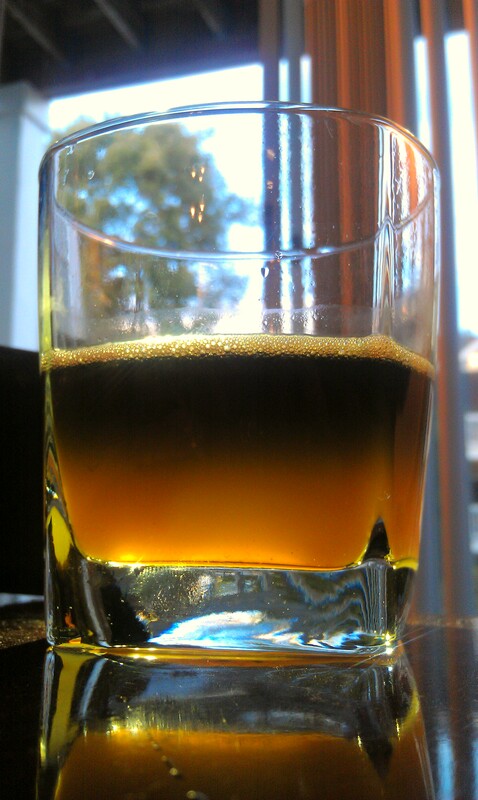 Or a screwdriver mixed with some champagne, however you want to look at it. To spook it up a little, I used blood orange juice and blood orange simple syrup to sweeten it. And I used Blavod, a black vodka that comes out around Halloween that’s good for layering and making multi-colored cocktails. The blood orange mimosa is sweet like Dr. Jekyll, and the vodka on top is the insidious Hydian influence. Perhaps if Dr. Jekyll would’ve indulged in a couple of potions more similar to mine every now and then, he wouldn’t have met such a miserable demise. If The Strange Case of Dr. Jekyll and Mr. Hyde is to be viewed as an allegory, the moral that I like to draw is one of my personal favorite philosophies: Everything in moderation, including moderation. If you want to draw the blood out of your marrow (to make it whiter), soak them in salt water over night, changing the water 2-3 times. Preheat oven to 450F, and arrange marrow bones on a cookie sheet or roasting dish lined with parchment paper. Roast bones 15-20 minutes, depending on size. you don’t want too much of the marrow to melt out. Remove bones from oven and let cool. Reduce oven temperature to 350F. Meanwhile, add milk, vanilla bean, cardamom, star anise, and cinnamon to a small saucepan and bring to a boil. Remove from heat and let steep. In a medium-sized bowl, whisk together eggs and honey. Once bones are cool enough to handle, use a knife, spoon, or combination of the two to scrape as much of the marrow out of the bones as possible into a small bowl. Some melted marrow will settle at the bottom of the bowl; you want to keep the solid pieces for your brulee. Gather 1/3 cup of marrow (using more will sacrifice a pleasant mouthfeel), cut into small pieces, and add to a food processor. Pour mixture into greased ramekins (I used leftover marrow. You could also use butter.) Place ramekins in a roasting pan, and pour boiling water halfway up the ramekins. Bake at 350 for 20-30 minutes, depending on the size and shape of your ramekin. My smaller ones only took 20. The middle should look set, and a knife inserted in the middle should come out mostly clean. To serve, spoon marrow into roasted bones (I returned mine to the oven for longer roasting for extra color) and spread the tops with sugar. 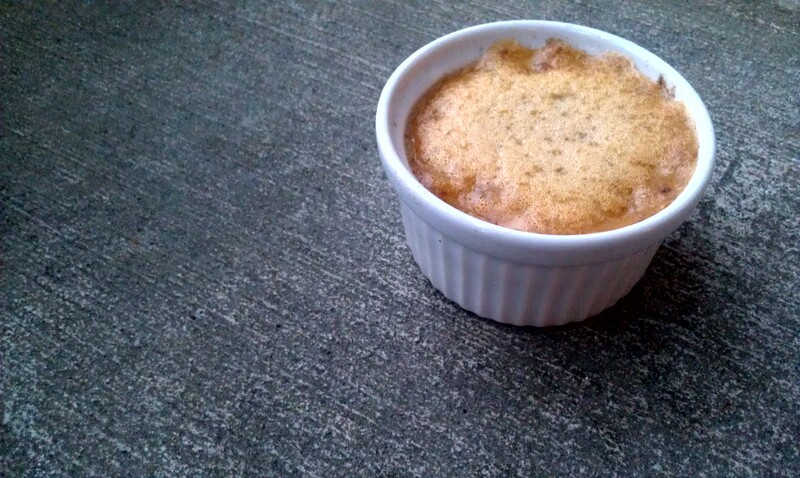 Brulee the sugar with a kitchen torch, or place under broiler until sugar browns and caramelizes. Add orange juice, Campari, and simple syrup to glass of choice and stir well. Add champagne, stir gently to incorporate. Measure out vodka and pour gently and slowly into glass so it floats on top of the cocktail. Add all ingredients to a saucepan, stir well. Place over high heat to bring to boil. Reduce heat to medium high and allow to boil 15-20 minutes, until reduced in volume by about 3/4. Set aside to cool. 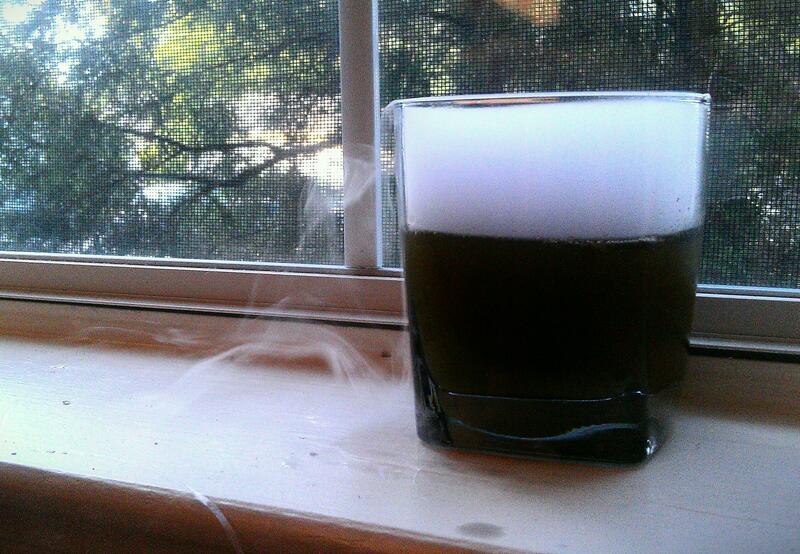 This entry was posted on October 25, 2013 by Emeliorations in Cocktails, Dessert and tagged blood orange, bone marrow, brulee, campari, Dr. Jeckyll and Mr. Hyde, dry ice, halloween, mimosa, orange juice, Robert Louis Stevenson, screwdriver, vodka.